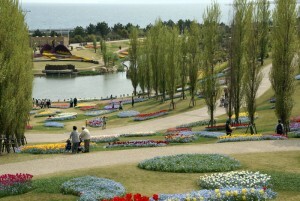 Awaji is a very large island with many things to see. Once you get away from the coast road it is a rural place. One possible walk will take about two hours once you are on the island. Take the JR to Akashi. Walk toward the harbour away from park-castle towers. There are two feries to Awaji, one for cars and the other for people. The people ferry is on the first big street to the right as you leave the station. It is not a very big place. About a 25 minute ferry ride. On Awaji, turn right on the road outside the ferry terminal; continue for a short distance and you will come to a shopping street on the left. Follow the shopping street until you come to a stream (encased in concrete). Turn left, following the stream uphill. You will pass a cemetery on the right and then after a little more walking there will be a small bridge on the right. Cross the bridge onto a paved path. Woods, rice fields, an old shrine. Easy walking but uphill. Eventually you will come to an open area of rice fields and roads. There is a temple on a rise to the right that doesn’t look like a temple. Take a left until you reach a T and turn right following the signs to “Awaji Accommodation”. Eventually you will see a sign to a spring; go that way. You will pass some ponds and maybe a cow or two, a swimming pool and not many people. There is a sign to “Eight Mat Rock” – don’t go that way, but go downhill and eventually you will come to another ferry. That ferry (much larger than the Akashi Ferry) will take you to Suma. Very easy to get to and worth the trip. 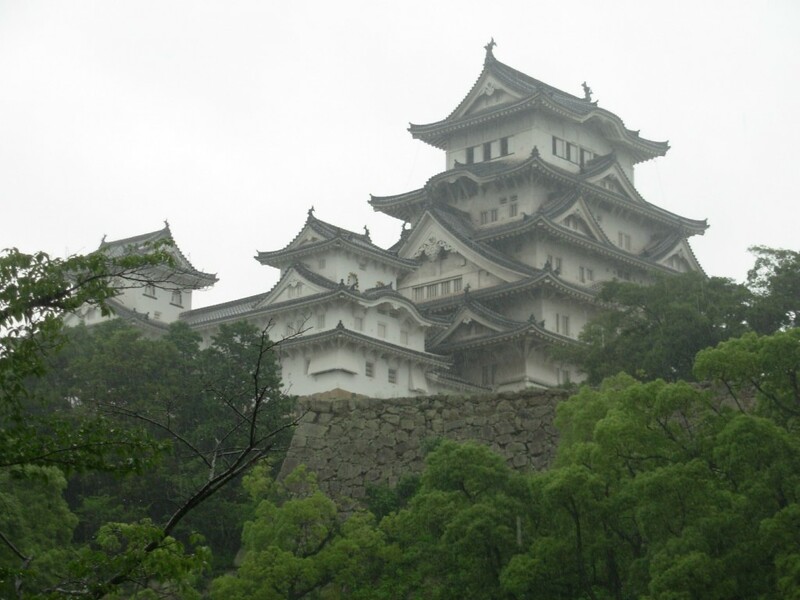 This castle is a good one to use as a judge of all other castles you might see while traveling around. Don’t just go to the castle but walk around the outside or maybe up some of the hills behind the castle to get a very different view.